Is this not the saddest thing you've seen all day? 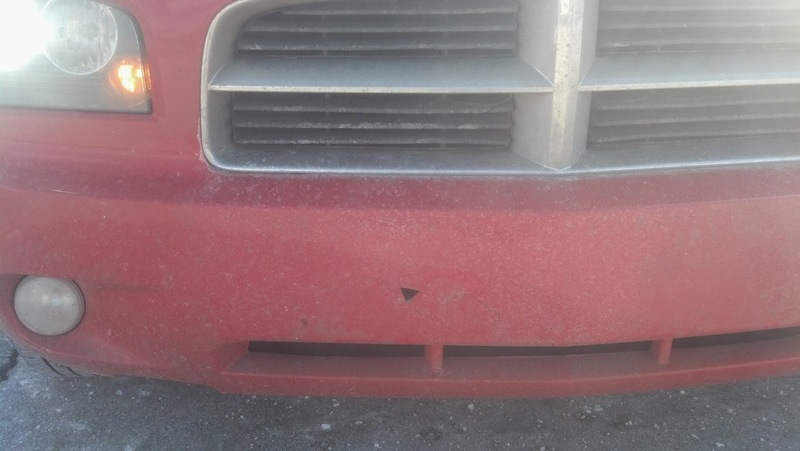 It's the front of my car, and the little hole you see is just part of a crack at least a foot long across my front bumper. Who knows what other ice/snow/slipping-sliding-vehicle damage I'll find when it's warm enough to wash off all the salt and mud?? While driveability is of course my first priority for upcoming road trips, I want my car to be pretty too! I bet insurance claims are up this year... The phones at don allred insurance are probably ringing off the hook. All things considered, I'm still looking forward to washing it off and driving a shiny car again. Counting the days til spring!